With Eid around the corner, it’s celebration time again. 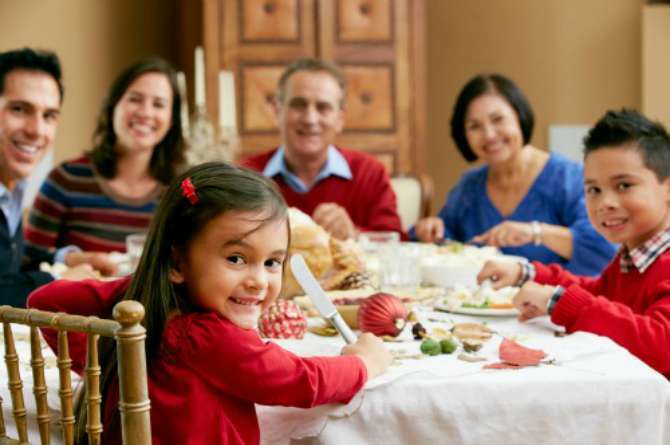 And without a doubt, the hallmark of this festival is sharing a delectable feast with family and friends. And among all, children are the most excited lot during any festivity as they insist on being a part of all the activities with great gusto. So keep them busy and involve them in making fun and easy dessert recipes for Eid. How, you ask? Read on. Here are some easy dessert recipes for Eid that are quick to whip up, yet the perfect way to end a feast. Most of these recipes require very few ingredients, making them child-friendly as well. Try this sugar-free easy dessert recipe for Eid and have everyone asking for more. Place the dates in a blender or food processor and blitz until transformed into a paste. Empty into a bowl and mix in ¾ tablespoon cocoa powder. Roll the chocolate paste into round balls or truffles. Combine the remaining cocoa powder with 1 teaspoon ground cinnamon on a plate. Roll each truffle around on the plate until they are all covered in cinnamon and cocoa. Tip: You could add a teaspoon of crushed flaxseeds or walnuts to improve the health quotient. 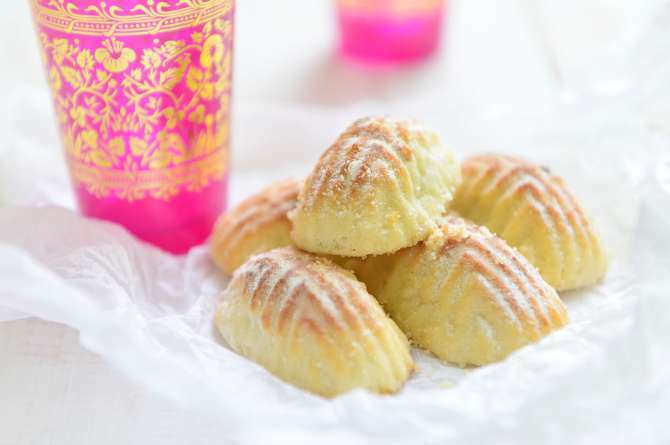 This simple, melt-in-mouth recipe is inspired from Maamoul, one of the popular easy dessert recipes for Eid from the middle East. Experiment with the fillings for variety. Puree the filling ingredients in a food processor until combined. Remove and set aside. Clean the processor bowl. Put the flour, baking powder, 1 tablespoon icing sugar, and salt in the bowl of a clean food processor and pulse to mix. Add the butter, oil, and milk pulsing until the dough just comes together. Do not blend the dough too much. Remove dough from the processor, and roll into equally sized balls. In the palm of your hand, press and pat each ball of dough into a 2½-inch circle. Place a rounded teaspoon of filling in the center of each round and draw the edges up and around the filling. Pinch the dough together to make a sealed ball, and then carefully roll the cookie between your palms to make a smooth round ball. Press gently to flatten the cookie slightly, then place them seamed side down on a parchment-lined baking sheet. Repeat with the remaining dough and filling. Gently prick the cookies with a fork or a wooden skewer in a decorative pattern taking care not to pierce the dough to the filling. Bake the cookies until firm and slightly puffed, and the tops are pale but the sides are just beginning to turn slightly golden, about 25 to 30 minutes. Dust generously with icing sugar, cool and dust again. Tip: Go creative with the fillings. A jam and walnut filling or an apricot and hazelnut filling also taste heavenly. Children love cake pops anytime of the year. So why not add it to the list of your easy dessert recipes for Eid? Gradually, add the sugar and beat until fluffy. Now mix the vanilla essence. Add this frosting a little bit at a time with your hands until the cake is moist and can hold a ball shape. Roll the mixture into a tight ball and place on a plate.Repeat until all the cake mixture has been rolled into balls. Melt the cooking chocolate over a water bath. Dip the tip of the cake pop sticks into the chocolate and insert into the cake balls about half-way. Freeze for about 20 minutes. 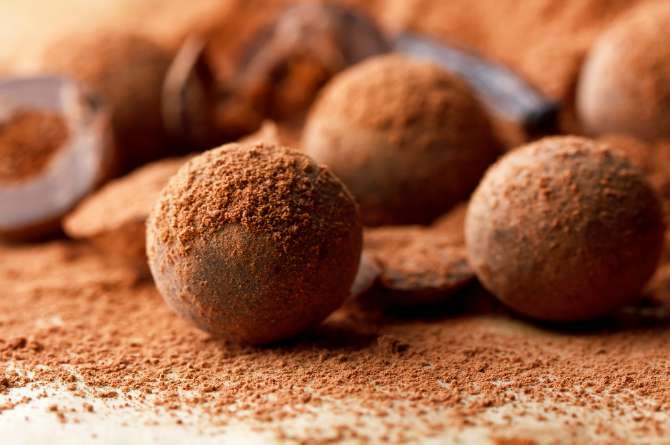 Remove cake balls from freezer and dip them carefully into the chocolate until covered. Let the excess chocolate drip off. Swirl and tap gently if needed. Add the sprinkles while the chocolate is still wet. Tip: The chocolate on the cake pops can harden quickly. Be quick with decorating the sprinkles. 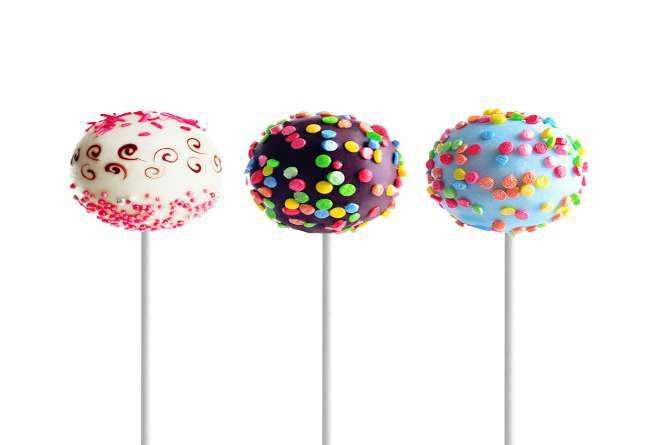 Stick the decorated cake pops into thermocol block to set. Experiment with white chocolate or coloured frosting for a colour burst. 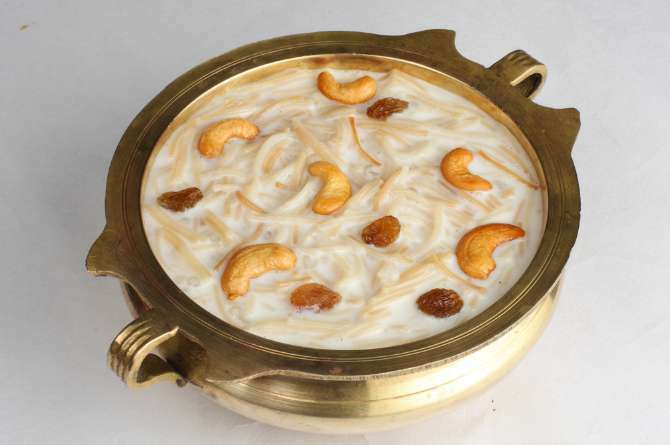 What is any Eid celebration without Sheer Kurma? Here’s a simple recipe. Heat the butter in a deep pan, add the vermicelli and cook till it turns golden brown. Add the sugar and milk and cook till the sugar dissolves. Add the dry fruits and raisins, mix well and allow it to simmer for 3 to 4 minutes. Add the dates, charoli, cardamom powder and rose water and simmer for another 1 to 2 minutes. If the sheer korma is too thick, add a little hot water and mix gently. Remove from the flame and serve hot or cold garnished with cardamom powder. The poached flavour of the apples mixed with the richness of sugar syrup is what makes this sweet dish one of those must-try easy dessert recipes for Eid. Peel and core the apples. Reserve the peels. To a large saucepan, add water and sugar and heat gently until all the sugar has dissolved. Now add the lemon juice and simmer on low flame. Add the apples to (do this quickly, if you leave the apples sitting around peeled for too long they will go brown). Cover the saucepan and let simmer gently for about 4-5 minutes. The apples should be just soft enough to poke with a fork or knife, but still maintaining their shape. Remove from the syrup with spoon and place in a container to cool. Continue to simmer the syrup and add in the apple peelings. Simmer, uncovered, for about 30 minutes. The syrup should be reduced and thickened. Remove the apple peelings with a slotted spoon and set the syrup aside to cool. Roughly chop the walnuts and raisins and mix in a bowl. Once the apples are cooled, stuff the centre with the walnut and raisin mixture. Just before serving, beat up some whipped cream with icing sugar to air it out. 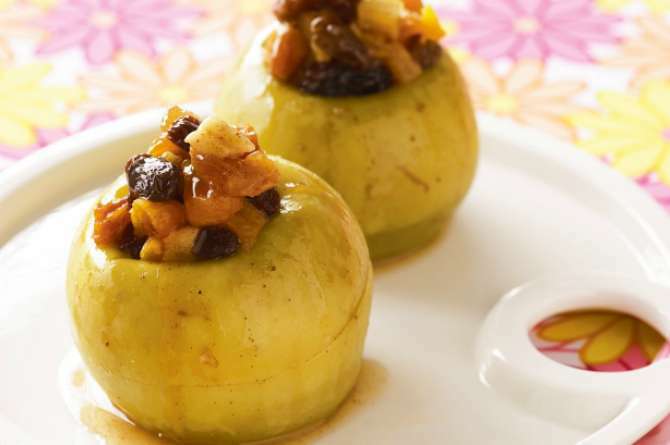 To serve, place an apple on a small plate and drizzle with some syrup and dollop some cream on the side. Tip: Rub some lemon juice on the apples after you remove the peels to prevent them from turning brown. An absolute feast to the eyes, this is one of those easy dessert recipes for Eid which makes for a wonderful way to end the meal. Dissolve each jelly packet with 1 cup of water and set in the refrigerator till firm. Boil the milk till thick. Now add the vermicelli and stir. Now add the corn flour cook till thick, remove and cool completely. Now add the condensed milk, mixed fruit juice and stir. Cut the jelly in cubes and add to the cooled milk. Also add the cream, rasagullas and mix well. Serve chilled. 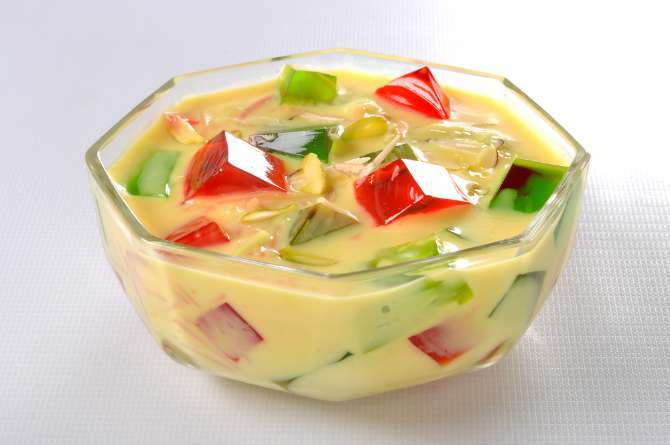 Tip: You could add chopped fresh fruits to this dessert as well. This sweet dish will be done even before you know it. And it’s one of those satisfying yet easy dessert recipes for Eid celebrations. What more could your sweet tooth ask for? 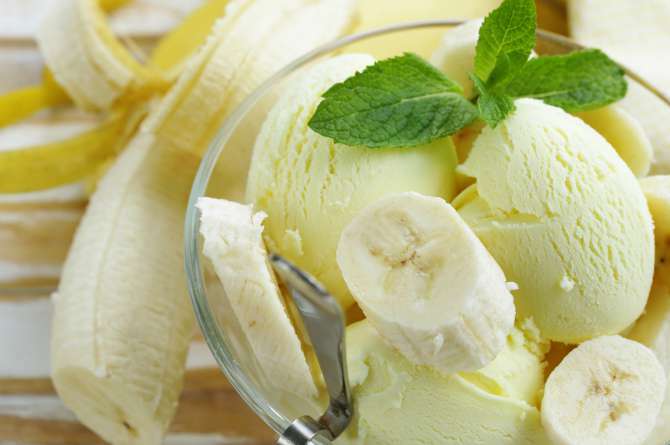 Place the frozen banana chunks into a mixer. Add the vanilla essence, sugar or honey and the curds. Turn on the mixer and blend for a few moments. Tip: Drizzle some chocolate sauce over the ice cream to make it sinful. 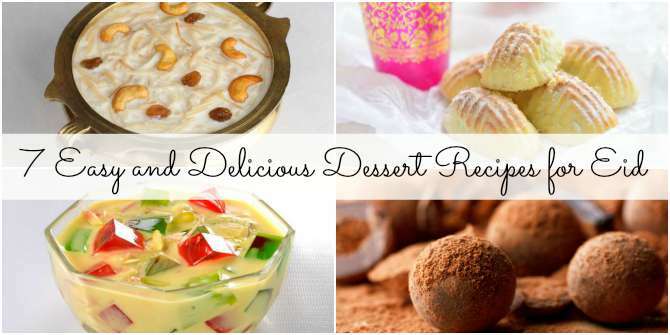 Do you have interesting easy dessert recipes for Eid? Share in the Comment box below.